The Flatout series, the poster child for wearing your seatbelt, has been burning rubber on consoles for over a decade. 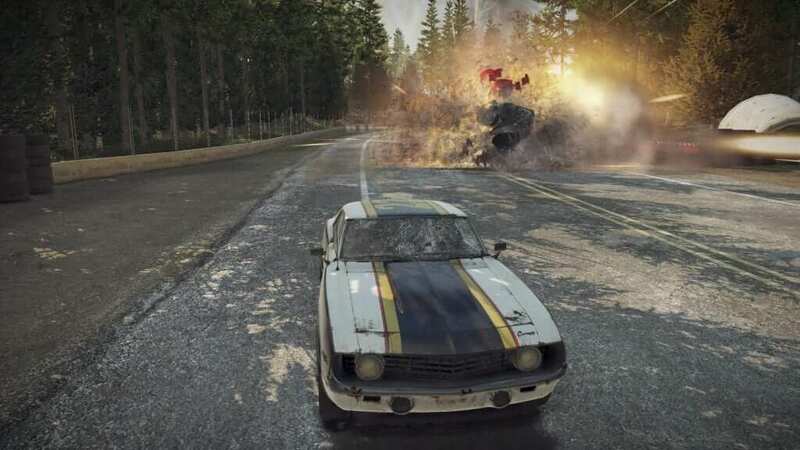 FlatOut 4: Total Insanity continues the franchise’s tradition of offering destructible racing, courses that can be torn apart by the vehicular mayhem and mini-games focused around propelling your driver through the windshield at various targets. From the first booting up of the game, it is obvious that developer Kylotonn is trying to live up to Flatout 4’s tagline of Total Insanity. Gamers are dropped into the stunt mode of the game before ever seeing a menu screen. You get to sit behind the wheel of a souped-up ride, and after taking it for a rather short trip, ejecting the driver out of the car at a selectable angle of arc. Players have decent control of the driver’s trajectory before he hits his target. While there are multiple events for the stunt mode, they all have a very similar flavor. In golf, you launch your driver and try to get them to land in a hole. In curling, you launch your driver onto the ice and try to get them to land in the center of a bullseye. In pong, you launch your driver into some beer pong cups. Noticing a theme here? With so little of substance to differentiate the events, they become tiring very quickly and I had little incentive to return to them. 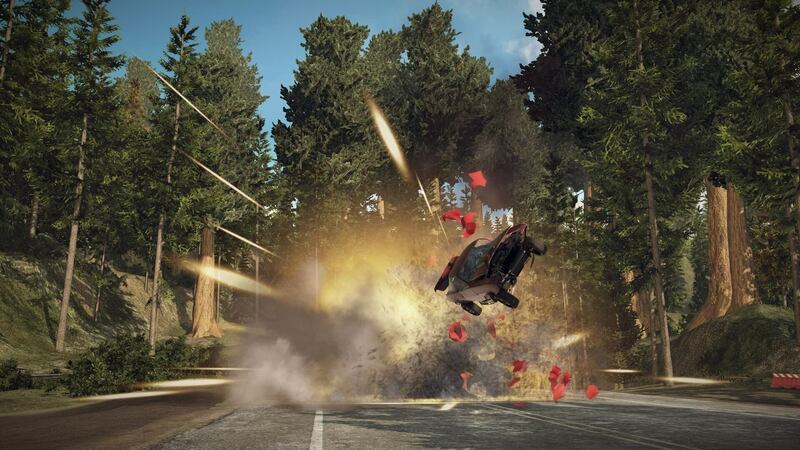 After four iterations in the series, I had hoped that Flatout 4 would have found something more interesting to do with their patented driver ejection system. While flinging the driver out of the car is the series’ hallmark, Flatout and Flatout 2 were solid racers so I was looking forward to hopping into some vehicular racing mayhem. I immediately gravitated to Flatout 4’s career mode where I bought a rusted out beater, emptied my wallet on a few upgrades and hit the track. 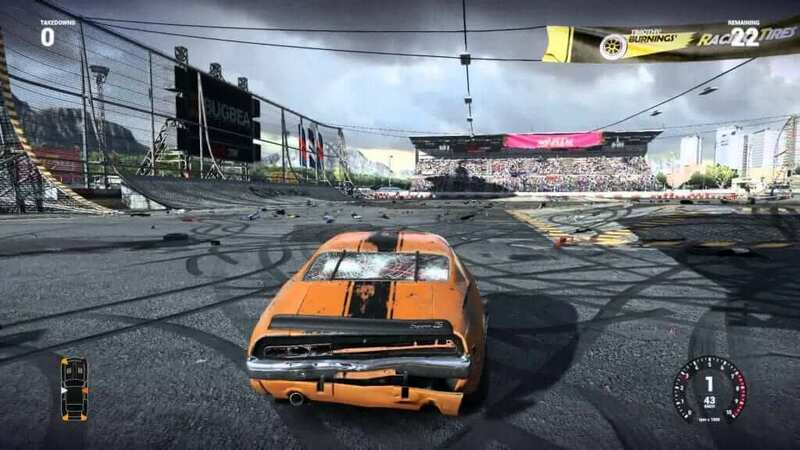 Each race fields twelve aggressive drivers that go out of their way to crash into you and each other throughout each lap. With cars that can only take a limited amount of damage, a bit of strategy is required to know when to simply pass an opponent or when to slam into them in hopes of taking them out of the race. The tracks offer a large amount of variation with many forks in the road so that racers coverage on each other from multiple paths almost encouraging collisions. I am not sure why but the series seems to always have a track throughout a lumber yard with other variations including snow covered race courses, abandoned industrial sites, and public works. With secret short cuts and destructible objects on the road, the level design is well thought out and I never grew tired repeatedly playing on the same tracks. This was certainly good because the difficulty level of Flatout 4 is higher than most racers these days. Most gamers will have to invest heavily in upgrades to their ride before they’ll be consistently hitting the third place minimum requirement to advance to the next series of events. I really enjoyed this dynamic where mastering a track and your vehicle are requirements to get very far in your career. The presentation in Flatout 4 is a bit of a throwback. Whereas the likes of Forza and Project Cars are presenting photorealistic vehicles and gorgeous environments these days, Flatout 4 has grittier visuals. It looks like it would be at home on the previous generation of consoles with cars that seem to have a dull sheen and damage modeling that is not representative of what you would see when two cars collide. Hitting the nitro makes matters worth as it turns everything on the screen into a virtual blur. While the game isn’t the prettiest, the soundtrack was one of the most fun I have encountered in a racing title. It is filled with unconventional tunes that stray rather wildly from the typical hard rock you usually hear instead dabbling heavily into Rockabilly and Ska sounds (good to hear you again Planet Smashers). While I didn’t always love each tune, you can skip any that aren’t your jam mid-race, the eclectic collection of songs seemed somewhat appropriate for this game. Everything up to this point of the review has been the “meat” to Flatout 4. The base driving mechanics and handling of your car is the “skeleton” on which the rest of the game hangs. Unfortunately, the skeleton has a few broken bones, osteoporosis, and a hunchback. In short, the cars in the game have to the loosest handling of any game I can recall playing since Crazy Taxi on the Dreamcast. Feather touch is required in turning or the vehicles over-steer. The cars ignore the typical momentum you would expect to feel in a driving game where a small tap from an opponent can easily spin you out of control. This also results in the cars feeling like they have no weight to them. This is nearly fatal for a driving game where car to car contact is a base dynamic of the gameplay. Many crashes do not end of having the same level of satisfaction to them because of this and the game is harder than it needs to thanks to the loose controls. Verdict: It is unfortunate that the loose handling of the cars still leaves a bitter taste in my mouth when I think of the potential this game had. If those types of controls are your thing then Flatout 4 is a solid title with a great career mode, engaging tracks and awesome soundtrack. I just can’t overlook the floaty controls that permeate throughout the game turning what could have been a Ford Mustang into a Ford Pinto. 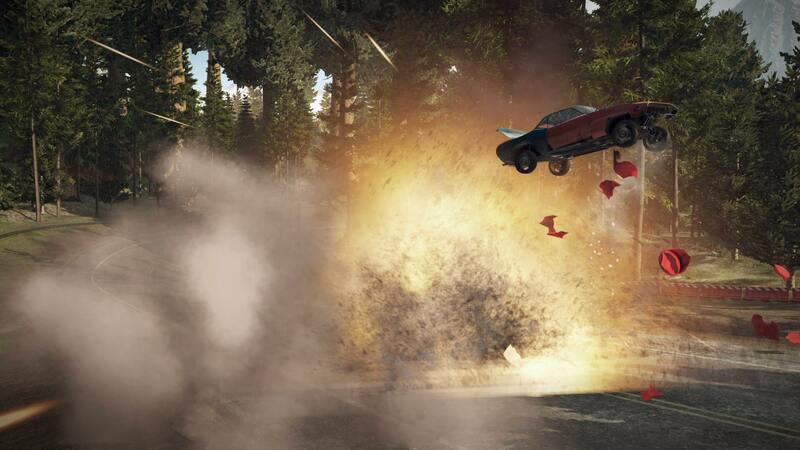 Flatout 4 is a racing combat game developed by Kylotonn and published by Strategy First. It is the fourth entry in the series that debuted in 2005. The game was released on March 17, 2017.